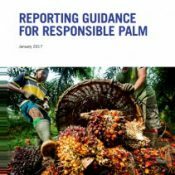 24 January 2017 | In an effort to improve­ corporate transparency on responsible palm oil to better understand practices at the ground level, a motley consortium released a guidance document today, which aims to establish “better practice” reporting for companies throughout the palm oil supply chain. This is where Reporting Guidance for Responsible Palm Oil comes in. The report not only aims to clarify and distill companies’ comments on the hardships of delivering on a zero-deforestation commitment, but also tackle new questions surrounding better reporting practices. “We know that communication, reporting, transparency, all of that is what underpins effective implementation,” Klein-Markman adds. “This document guides companies towards reporting that is most meaningful and material to a wide range of stakeholders and contributes towards our collective goal of making palm oil production sustainable and deforestation free,” Fiona Wheatley of the British retailer Marks & Spencer said in a statement. Palm oil is the most widely used vegetable oil in the world. Its versatile nature makes it an easy ingredient in anything from shampoo and lipstick to cookies and peanut butter and it’s inexpensive and efficient to produce. Despite its benefits, palm oil has a notorious reputation as it’s deeply tied to tropical forest and peatland loss, which drives climate change and destroys the habitat of orangutans, tigers, and other endangered species, while also generating adverse health impacts and even human rights abuses. A recent report estimates palm oil production was responsible for 240,000 hectares of forest conversion annually from 2001 – 2011 in major producing countries such as Indonesia, Malaysia and Papua New Guinea. Indonesia has one of the highest deforestation rates in the world. The forest loss releases tons of carbon into the atmosphere while displacing people and species in some of Earth’s most biodiverse areas. In the past few years, companies have moved to reverse or at least curb their role in this global problem with commitments to reduce or eliminate deforestation from their supply chains establishing time bound targets to achieve 100% sustainably sourced palm oil. Leonie Lawrence, the Global Palm Oil Manager at the Zoological Society of London (ZSL) says transparency must be at the core of this undertaking. “There is real movement on sustainable and deforestation-free supply chains and that’s fantastic, but this movement absolutely requires transparency,” she says. Palm oil is just one of four products driving the lion’s share of deforestation, and companies are setting commitments on all four forest-risk commodities. “Our research shows that hundreds of companies have commitments to remove deforestation from commodity production and their supply chains, many of which are related to palm oil,” says Stephen Donofrio, Senior Advisor to the Forest Trends Supply Change project, which tracks the progress that companies report on their sustainability commitments. Supply Change tracks corporate sustainability commitments from the four forest-risk commodities, soy, beef, wood products and palm oil. Together these commodities drive at least 70% of tropical forest loss, according to Forest Trends research. Achieving zero deforestation supply chains for these commodities is no easy feat. They’re famously complex though Supply Change data reveals that companies are moving the fastest on palm oil. As of March 2016, 61% of companies active in palm have adopted pledges, compared with only 15% in cattle and 19% in soy. Plus, 2015 CDP research estimates that 74% of reporting companies that pledged to source certified palm oil have integrated this policy into their supply chains. “Palm oil is in many ways a pioneering commodity for these no deforestation commitments,” Klein-Markman says. Supply Change informed the guidance as did ZSL, the Union of Concerned Scientists, CDP and WWF among other organizations. From the private sector side, Seventh Generation Interfaith Coalition for Responsible Investment and Green Century Capital Management also participated. Donofrio agrees noting the current complexities. The guidance builds on the ongoing activities happening in the palm oil space. The sector has the Roundtable on Sustainable Palm Oil, for example, as well as some reporting frameworks. NGOs such as WWF and UCS also have user-friendly scorecards to rate businesses’ sourcing of sustainable palm oil. ZSL is responsible for the SPOTT (Sustainable Palm Oil Transparency Toolkit) interactive website, which assesses, scores and ranks 50 of the world’s biggest palm oil producers based on publically-available information. Supply chain transparency, for instance, includes five steps that focus mostly on traceability issues – percent of physical supply from traceable mills and estates, and on reporting the names of the company’s direct palm oil suppliers. Three steps fall under the monitoring and engagement category including one that recommends companies describe their efforts to monitor and support legal land tenure. Authors break down the palm oil supply chain into three areas: Growers, processors and traders, manufacturers and retailers. Depending on where an entity is in the palm oil supply chain, the reporting rules will vary. All 21 steps apply to growers, processors and traders while the guidance recommends retailers follow five of them when not purchasing directly from a grower. The goal isn’t necessarily for companies to report on every step the guidance recommends immediately but allow companies to pick the pieces they feel are relevant to them. “The guidance isn’t meant to be a black or white exercise where you either do everything in the recommendations or you do nothing,” Klein-Markman says. It’s meant to inform or start a conversation, a vehicle for companies to engage with their suppliers or environmental groups on achieving their no deforestation commitment for palm oil. Lawrence adds the guidance is a support document to companies helping them determine best practices and benchmark progress. She’s confident that the consistency and clarity it delivers on these issues will result in wide uptake within the palm oil sector. Reporting Guidance for Responsible Palm Oil attempts to address several critical questions on reporting. How can manufacturers report on the practices of the companies they purchase palm oil from in an aggregated way that tells meaningful information? How are companies supporting and enforcing compliance of their sustainable palm oil policy throughout their supply chain? When is the appropriate time in the process to disclose different bits of information? “We thought about important topics at the ground level and the different roles of different actors in the supply chain,” Klein-Markman says. Achieving transparency throughout the supply chain, something companies cited as a major challenge but also critical to achieving their commitments, is a huge part of the guidance. Essentially, Klein-Markman says following the guidance is taking a proactive approach allowing companies a chance to address and identify new challenges before other groups do. Correction: An earlier version of this article said Green Century Capital Management was launched by Greenpeace. The group has no affiliation with Greenpeace.